The Wicklow Mountains, Co Wicklow. Photo by Michelle Meagher. 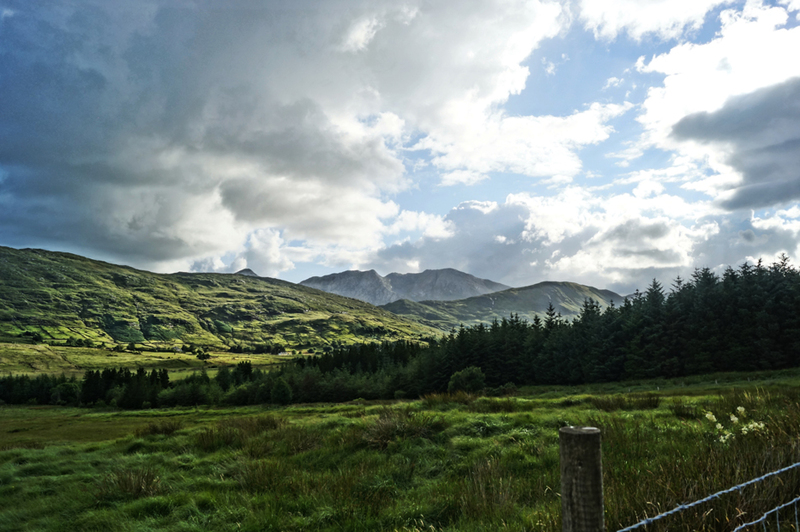 Michelle Meagher’s photographs of her first trip to Ireland. This panoramic view of the Wicklow Mountains and Lake is my favorite of all the pictures I captured on my very first trip to Ireland over the summer. My boyfriend, Brendan, who acted as my tour guide, pulled over on an almost nonexistent shoulder so I could take a few photographs of one of Ireland’s most breathtaking landscapes. The depth and clarity of this picture really gives you a sense of the mountain’s enormous range, which extends for miles and can be seen fading within the periphery of this photograph. It was truly humbling for me to be in the presence of such vast beauty. The narrow roadway up to this point was nail-bitingly treacherous, and both road and scenery had my heart rate going – for two different reasons, of course! The view through the Wicklow Mountains, and this picture in particular, is incomparable to any other place I’ve seen in Europe. You must be wary you don’t take your eyes off the road for too long to gaze upon these gorgeous green giants lest you plummet down the unforgiving valleys or collide with oncoming traffic. My advice is, better to pull over where you can enjoy this outstanding view and take it all in. A view of the nature and windy roads through the Wicklow Mountains, County Wicklow. 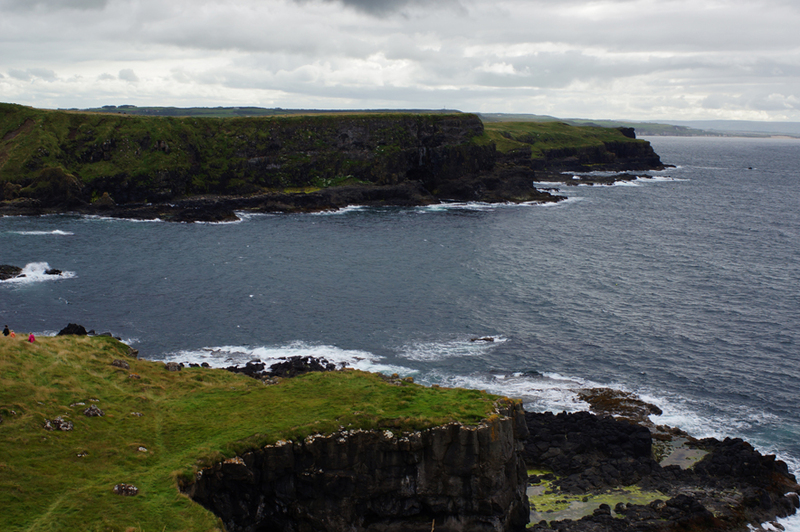 The Cliffs of Moher, Liscannor, County Clare. 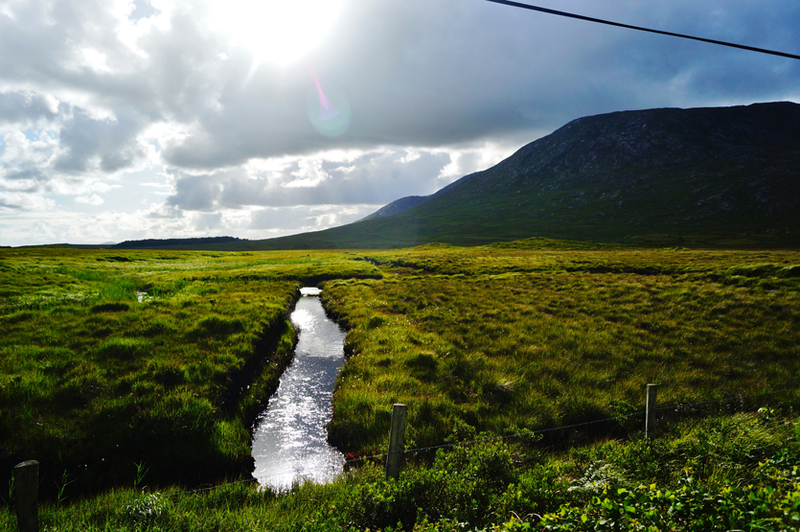 This picture was taken en-route to Belmullet, County Mayo on R313. The rain had just passed and the sun lit up this great open field. Another quick photo-op was in order. On R313 in County Mayo. 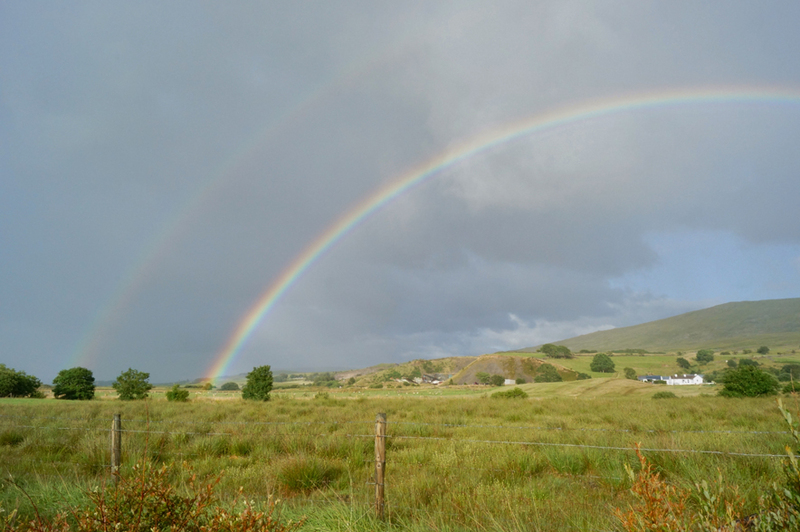 A double rainbow on R313. 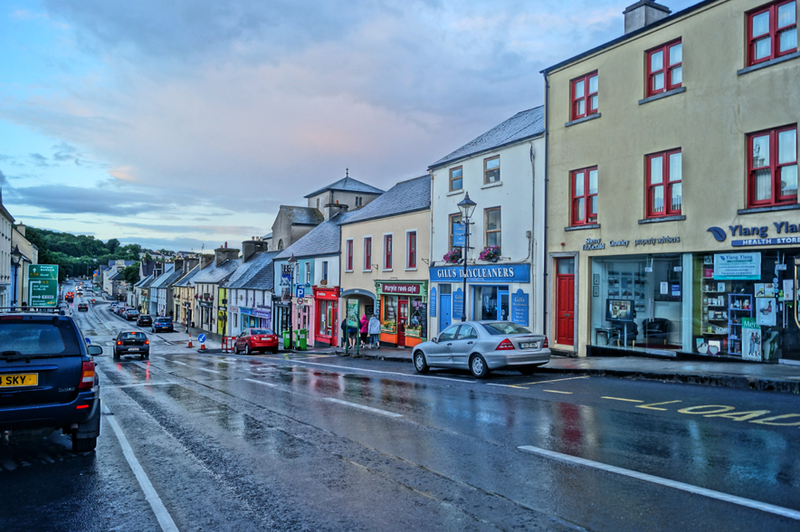 In the city of Westport, County Mayo. I enjoyed the best pint of Guinness I’ve ever tasted and an impromptu traditional seisiún at Una’s Pub in Faulmore, County Mayo. 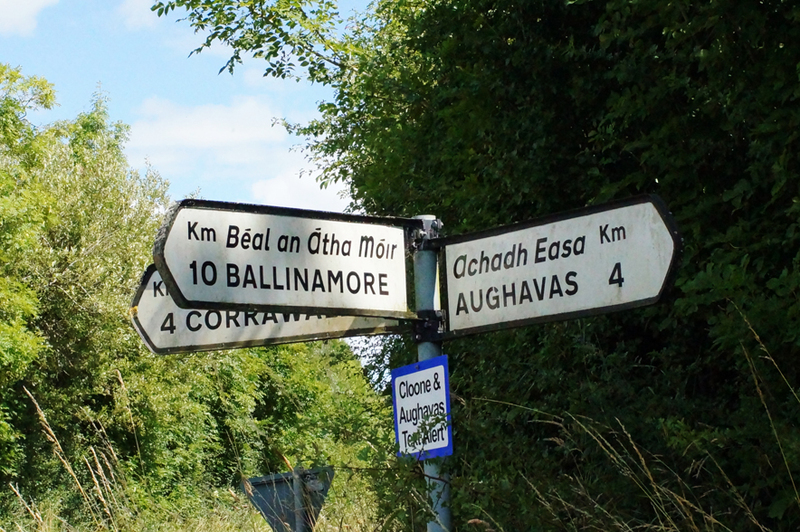 Traveling from Aughavas to Ballinamore, County Leitrim, the town my grandmother emigrated from. The Giant’s Causeway, a World Heritage Site located in Bushmills, County Antrim in Northern Ireland. 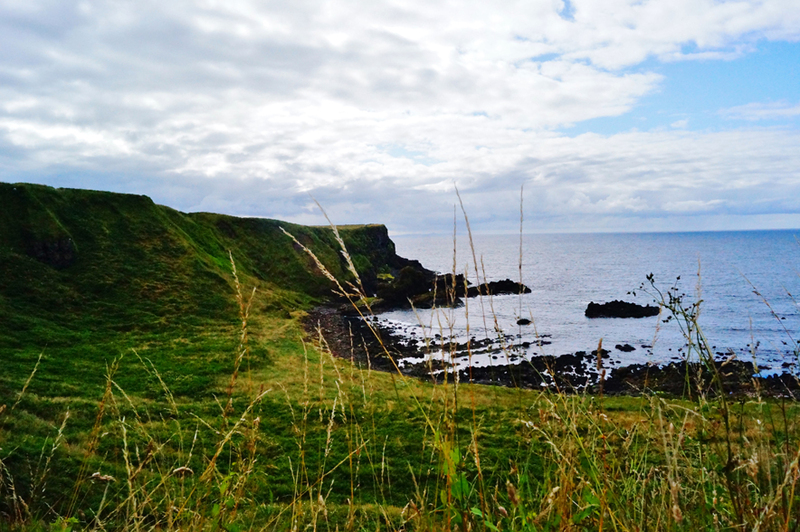 The Giant’s Causeway, Bushmills, County Antrim. 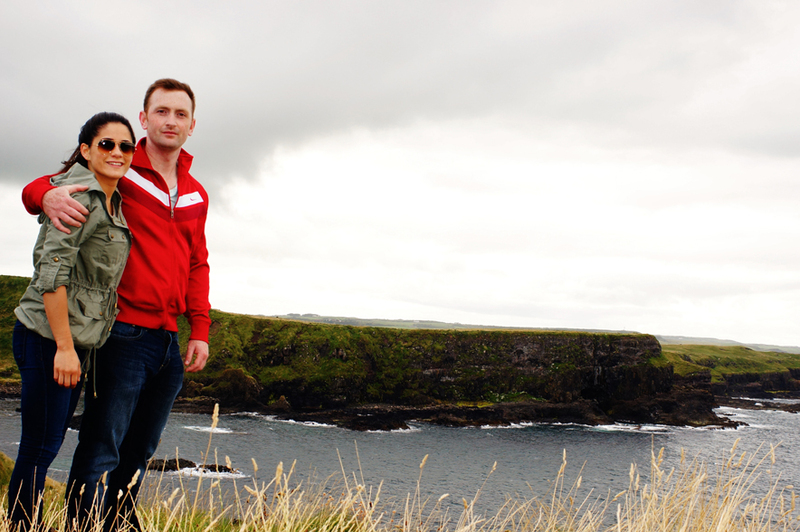 Me and Brendan at the Giant’s Causeway. Hi Michelle–Beautiful pics. My wife and I have been to Ireland 4 times, and have many of the ones you took. Each time we visit we end up taking about 1,000 photos. We have so many images that we’ve done travelogues. You have a great eye for the great shot. Thanks for sharing. I especially like the one of Westport. My two grandmothers, with family names of LOGAN and FLYNN, also were born in Ballinamore, County Leitrim. Fantastic pictures and especially the opening ones of WIcklow – among my favorite spots in Ireland. Your image of the Cliffs of Moher also very impressive. The last time I was there the wind was lashing the waves against the cliffs. It was nice to see the calm in your photo here. Thanks for sharing.